I remember what I thought when the first Kingdom Hearts game was announced; “Square Enix are digging their own grave”. I thought the game was going to be a huge disappointment, not to mention embarrassment. But I bought it (who didn’t?) and I was proven wrong. Squenix showed us once more that they are a company that can be trusted and with Disney by their side, the game proved to be more intriguing and entertaining than I had dared hope. Will the sequel be just as successful? First of all, you have to understand that Kingdom Hearts II is not a direct sequel to the first game. 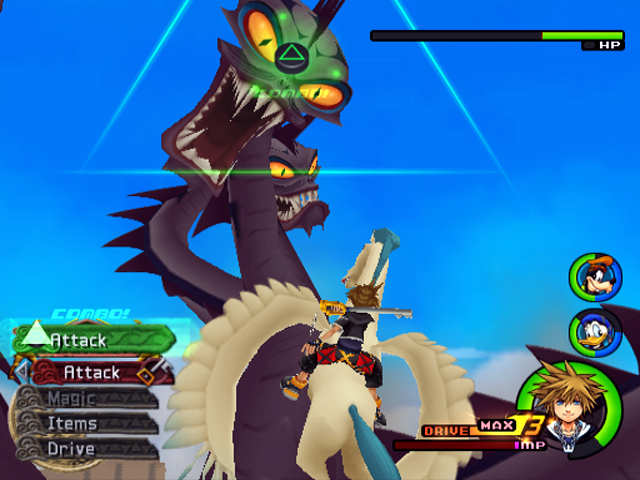 As it turns out, Chain of Memories for the GBA was not just a game released to keep us busy while we were waiting for KH2, as I had thought, no, the story actually continued from where KH1 ended. 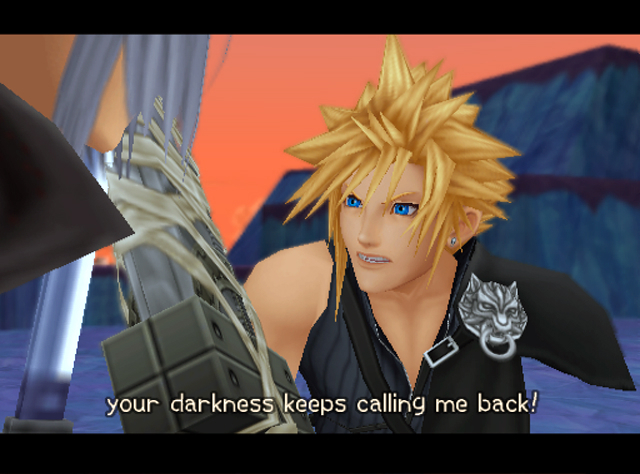 So, when I discovered that you start the game playing as Roxas (who’s connected to Sora), I felt disappointed. And honestly, there are a lot of mini games and stuff that you have to go through with him before you get the real deal. I didn’t enjoy those mini games at all, I felt they were boring, took a lot of time and I was just eager to get on with it. 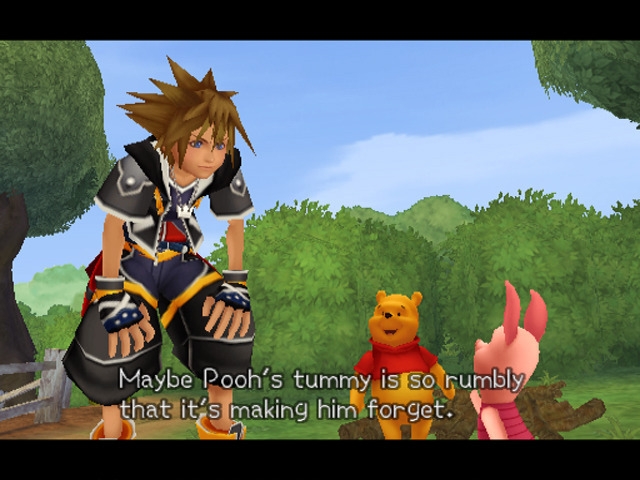 I’d hate it if KH2 turned out to be a boring, slow game. So when the real action started, I was feeling pretty nervous. 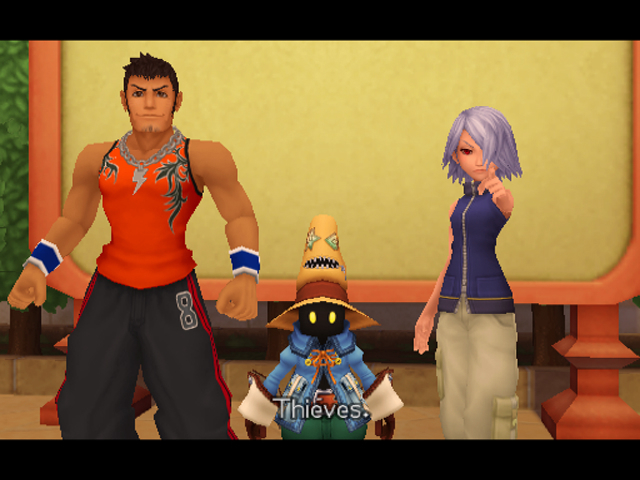 One big complaint concerning KH1 was the camera that, some say, could’ve been better. So has it improved? Well, slightly I’d say. You can still get caught in some very weird angles during fights (when cornered for example). But I didn’t notice any huge changes, perhaps because I was not one of those who complained about the camera the first time around. What I find a much more welcome change is the size of the worlds. They are – how should I put it… petite. They are so simple, so short – even though you return to some of them and discover opened paths – they don’t take long to complete. And this is a great improvement if you ask me. I got really frustrated in Tarzan’s jungle in the first game, and don’t even get me started on Wonderland. Getting lost, searching for a save spot, there is none of that. 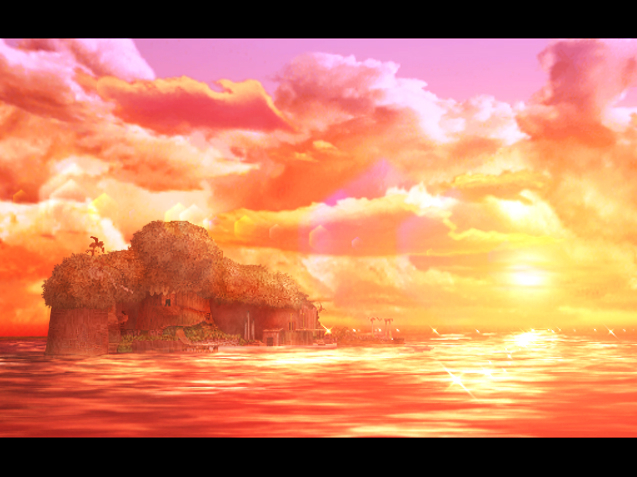 Another big change can be found in Atlantica. 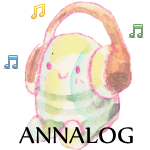 This time around, there are no battles, just – singing. Time the press of a button to complete different challenges and you’re all set. While some might find this a bit childish and even embarrassing, I think it’s great, not having to fight underwater, because that was not the easiest thing. And no more fighting in the air either, Peter Pan has been “reduced” to a Summon. The world map has changed too, it’s in 3D now, and instead of warping to worlds when you’ve cleared the path with your Gummi Ship (which editor is still as confusing as the last – my advice is, stick to the blueprints) you can just fly or dash around in “space”. The routes you open with your gummi ship, really feel like old school shooter games. 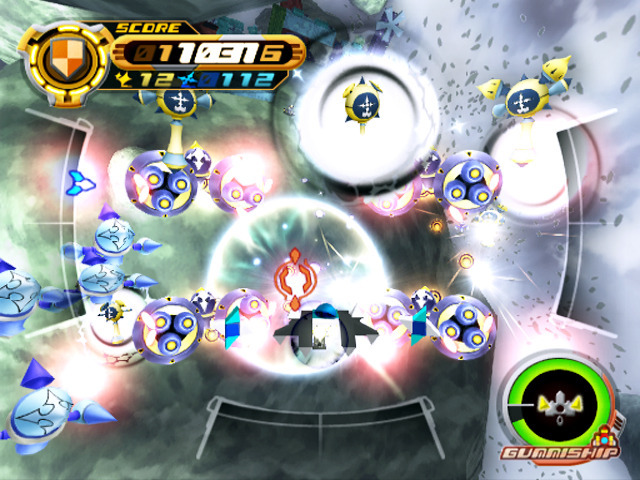 Enemies are coming from every direction, shooting like crazy and you’re firing missiles like a mad-man. But it’s great fun and there are extra missions for all the paths between the worlds, if you’d like to have another go. Battles are pretty much the same, but there are now action commands that can be executed when the triangle-button is pushed at the right time. 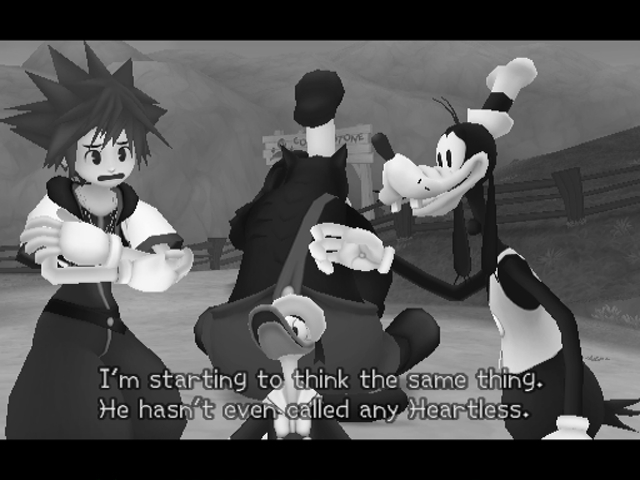 Sora can also take on different forms, for example Valor and Wizard, where either Goofy or Donald will merge with Sora, giving him greater strength or magic. I didn’t use that option much; I liked the battles the way they were. Summons are pretty much used for fun only, you don’t really need them, and since Kingdom Hearts is a hack’n’slash game, that’s what I did. I love being on the offensive, I don’t care how much damage Sora might take cause your friends will always heal you when you’re in a pinch. Just make sure they have items equipped. To help with that, items such as potions can be automatically equipped after each battle; all it takes is a small setting in the menu. Yoko Shimomura is back with another excellent score. Some tunes have been recycled from the first game of course, but there are also brand new tracks. The battle themes are my absolute favorites. Buy the soundtrack and listen to amazing and fierce songs like Sinister Sundown, Desire for All That is Lost and Dance to the Death. It’s pretty amazing to think that Yoko Shimomura didn’t want to compose the music to the first game; she felt it would be a flop. Now it’s hard to imagine the KH-games without her compositions. The opening theme Passion, sung by Utada Hikaru, is another huge favorite. I had that song on repeat for 3 days in a row – no exceptions. I know, I’m crazy, but can you blame me? The pretty graphics haven’t really changed, maybe they’re even better this time, but it’s so hard to tell since they are so exceptionally beautiful. Some scenes look even prettier than the movies they were taken from! Speaking of which – new installments from the Disney-library are; Pirates of the Caribbean and Tron. If you feel it’s a bit bizarre seeing Sora next to Kiera Knightley, Orlando Bloom and Johnny Depp, you’re not alone. That was one weird trip. Despite the fact that I missed a part in the Kingdom Hearts story, I thoroughly enjoyed this experience, though it is kind of short – approx 35 hours. I laughed out loud a lot, because there is lots of humor and there are also plenty of touching scenes, to which I sat and sniffled. Even though Disney and Squenix seem like such an odd pair, this combination really works. And judging by the series’ popularity – they’ve probably managed to win more hearts than they themselves were expecting. 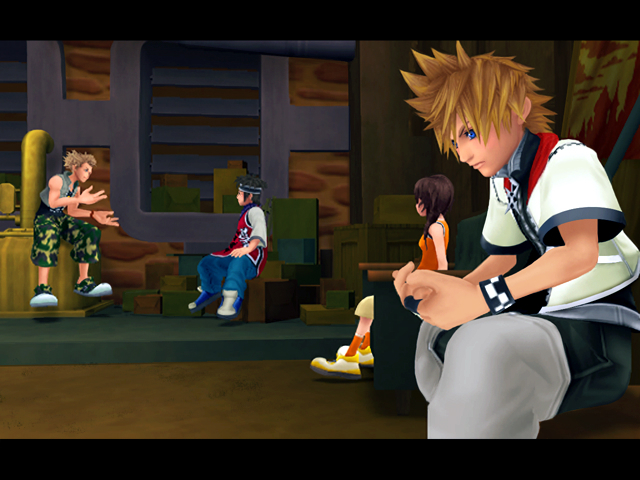 If you haven’t gotten into the Kingdom Hearts-frenzy yet, I suggest you do so. There is no point in missing out on an adventure such as this.